Yenmet metallic thread is specifically designed for today's high speed industrial embroidery machines. It has abeen developed to run similar to regular embroidery threads at high production speeds without breaking, tangling, or shredding. Unique construction consisting of a nylon core wrapped in a silver exterior which is dyed and then coated with a polyester film provides an incredibly smooth finish and vibrant color sheen. 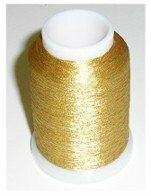 10 karat Gold Yenmet thread - 7008 500m/spl. 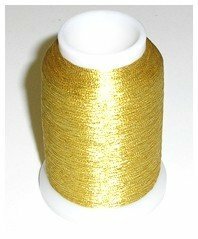 Aztec Gold Yenmet thread - 7014 500m/spl. Solid black Yenmet metallic thread - 7020 500m/spl. 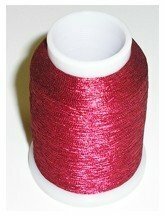 Solid cranberry Yenmet metallic thread - 7004 500m/spl. Solid green Yenmet metallic thread - 7007 500m/spl. 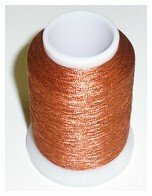 Solid copper orange Yenmet metallic thread - 7007 500m/spl. 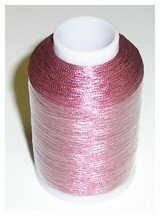 Solid pink Yenmet metallic thread - 7023 500m/spl. Solid red Yenmet metallic thread - 7024 500m/spl.